Warning: This is a long story. But it's got a smile at the end. Last week, while the rest of the country was battling the elements, SoldierMan and I took advantage of the "snow days" by ramping up our search for SoldierMan's Valentine's Day present: a puppy. I need to preface this by saying, I'm not a dog person. Like, at all. I know that you probably think this consigns me to some lower circle of Hell, but dogs have just never appealed to me. I'm definitely a cat person. SoldierMan has had his heart set on getting a husky since....forever. 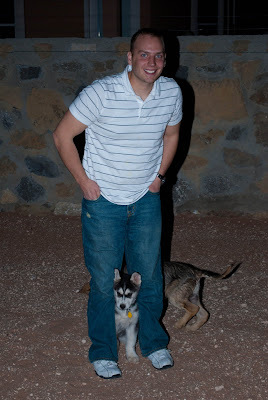 He had a husky growing up, and when we got married we couldn't get one because we didn't have a fenced-in backyard. Then we lived in an apartment. Now, though, we're in a house with a yard with a fence and in a place we'll be for a few years. Before we left that morning, we discussed potential names for the puppy we would get. SoldierMan already had a name specially picked if we found a girl puppy. But he needed help on boy names. So, being me, I pull up the complete list of Shakespeare characters and start reading off names. If it was up to me, we'd have pets named Hermia and Puck. Seriously, can't you see a pretty silver husky named Puck?? But he couldn't. 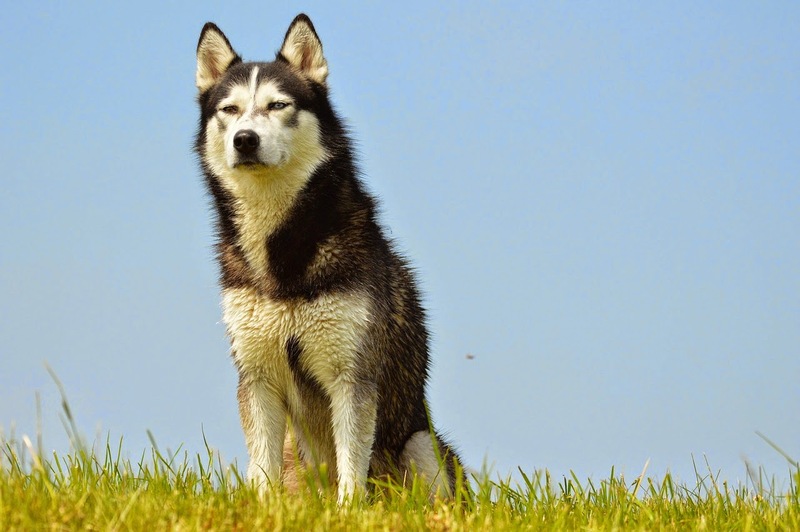 However, when I read "Achilles," that just sort of seemed to fit a majestic looking animal like a Husky. Doesn't that look like an Achilles? Then I mentioned I liked historical names, like Stonewall (after my favorite military figure, natch). He didn't like Stonewall, but we settled on Jeb. 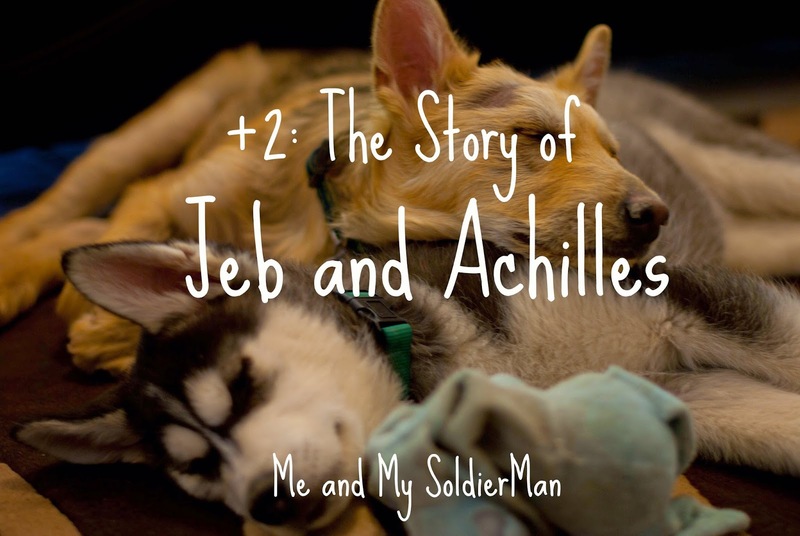 So, Achilles or Jeb. Depending on how the dog struck us. I know, completely dissimilar names, but that's what we liked. So, with names chosen, addresses written down and audiobook in the car, the search began. Part of that search involved trips to two pet stores (approved by the local Humane Society, fyi) as well as a no-kill Rescue and the Humane Society. That was the most heart-wrenching experience I have had in a long time. As we were walking through those shelters, especially at the Humane Society where they let us walk through the kennels on our own, I was to the point where I couldn't make eye contact with the dogs that were there, and I was choking back tears when we left. The worst was getting to the last cage and seeing a full-grown beautiful pit bull sitting in his cage, totally not trying to get our attention or look "adoptable," he just sat there looking at us like, "I know, I know. You aren't going to pick me. Move on." Ugh. 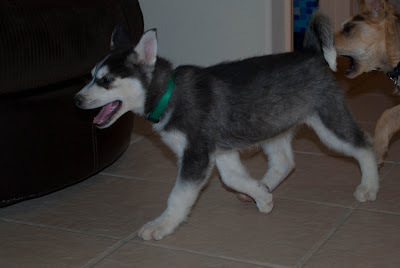 Then we went to another Rescue to see a dog they had listed as being a Husky puppy. We were really anxious by that point. We had been driving all day and hadn't eaten in hours, and even though we knew not to expect anything our first day out, it was really, really hard not to hope. We're standing in the office and they bring in this puppy - that is so obviously NOT a husky. He was completely brown and a little mangy and had a bald patch on his head where the crate he was dumped in rubbed his head because it was too small for him. And at first, we were both totally let down. After all day, talking to these people on the phone and thinking this was the dog we were looking for...it's not. And she lets his off the leash, and he runs straight to me. And when another dog in the room startled him, he clung to me. And dangit, he looked like a Jeb. We told them we'd think about it and got in the car, still kind of upset that it wasn't a husky. But we couldn't stop talking and thinking about him the rest of the day. And so, on Saturday, we went back to the Rescue and got him. So I got my Jeb. Of course, this still didn't get SoldierMan his husky puppy. We had several feelers out and a couple of good leads. That afternoon, right after we had gotten home with Jeb, SoldierMan got a text that a husky puppy about the same age as Jeb was available to pick up - right now! 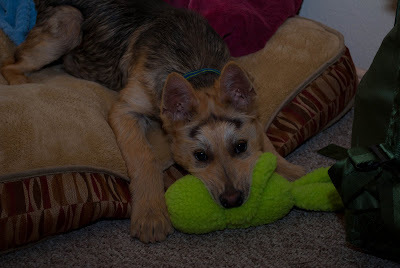 So, after a quick trip to the store to get supplies for yet another dog, we made a rushed trip across the state line (it's pretty near impossible to get a puppy from a private citizen in El Paso. They have very harsh restrictions on pets.). Jeb wasn't too happy he had to ride in the back while I held the new puppy in the front, and when they "met" at first, Jeb was very skittish around the new guy. 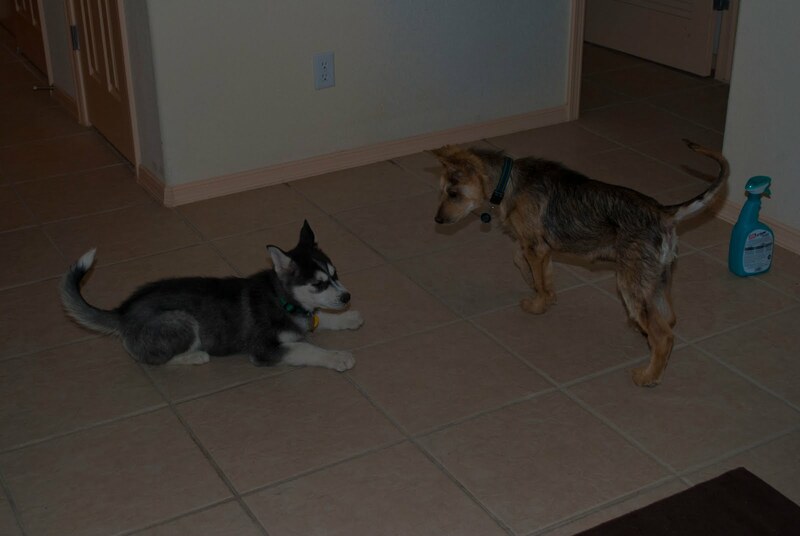 But once we got home, to "his" territory, the Alpha came out. If you're going to the lower circle of hell, I'm going with you. I'm not a dog person (or cat for that matter). Although I do love our dog that we inherited from my grandparents, I don't have the desire to own another one after he goes. That last photo is precious though. I hope you guys love being dog owners and the training goes well! Okay you guys are awesome! I want a few different kinds of dogs especially with how often Mr. Superman is gone, I like to feel protected. Those dogs though, are seriously fantastic. That is such a wonderful story. They are beautiful puppies. Congratulations on your new additions. I absolutely LOVE the last picture; it melts my heart. Of course you already know that I love it!! When Mark is away I feel so much safer knowing that my dogs will alert me (and the rest of the neighborhood) to any suspicious activity. I hope yours do the same for you! What BEAUTIFUL new additions you have there! I hope you end up loving them more than you think. :) Jeb is absolutely precious and so is Achilles! We just got a Husky, too! (Pics are on my blog). Ours is 9 weeks old today and she is an absolute handful! Good luck with two puppies! Your pics are adorable! Oh my gosh! They are adorable - you are going to have so much fun with them (and maybe a little mischief?!?!)! I would have been in tears if I went to the Humane Society. There is absolutely no way I could do it! I'm so glad that you got two beautiful puppies. They are adorable and are going to be friends forever! OMG, they're so cute!!!! I know exactly what you mean about the heartwrenching-ness of being at a shelter. How we got our dog was at an adoption event. There were over 20 bulldogs (I totally understand your wants for a certain breed - we did) up for adoption. You just want to provide help for everyone, but you can't. But the home you are providing for the 2 dogs is great. They're so cute. And I'm glad they get along!!! I look forward to more puppy posts!! we recently got 2 chocolate lab puppies and though the ups and downs I love them even if they drive me nuts sometimes. 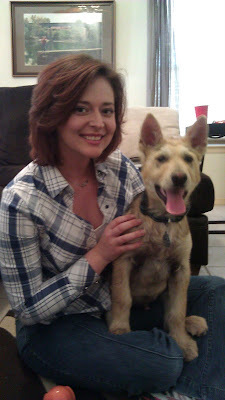 I had never owned a pet until my husband rescued a dog from a kill shelter, while we were dating. He was in the Army so we had to keep it at my apartment. The dog and I kind of kept our distance for about 3 days then we became inseparable. She's been our baby for over 7 yrs now and I can't imagine not having her here with us. Being a pet owner is like being a mommy of a little kid. Soon you'll be telling the hubby "OMG, look what Jeb/Achilles can do" hahaha! Enjoy your two new puppies! They are two lucky pups! I am not a dog person either, but that last picture is just precious. Congrats on your new additions! Aw, look how cute they are together!! =) I love it! I was hoping you'd post about this so I could get the whole story. I love your...Jeb. Shelter dogs are the best. ;-) Not that I'm biased or anything. Aw! They're both really cute! I love that last picture... too cute!!! 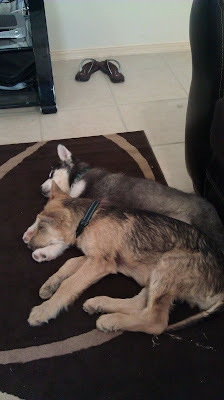 I love how you went from not being a dog person to two dogs in one day. 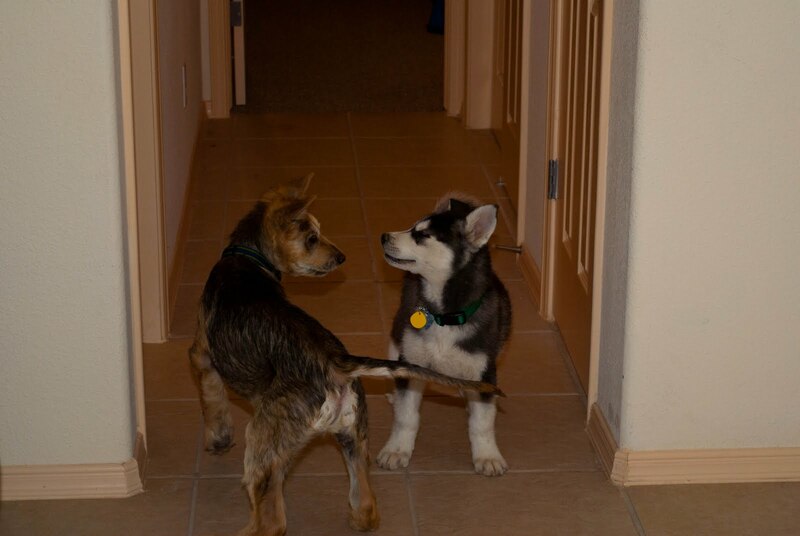 The picture of the two dogs looking at one another is just precious! yayyy! Congrats on the new puppies. They are BOTH adorable. I'm ESPECIALLY a fan of Huskies, but love all big dogs. Congrats! They are adorable pups! Love the pictures! Nothing wrong with being breed specific - we have two border collies and wouldn't have it any other way.